and are changing the culture of care. Presence is the cornerstone of caregiving. The I’M HERE MOVEMENT is a 501-(C)3 not for profit which is changing the culture of care through the use of two little words. It is a global effort to help health care professionals embrace the power they have to comfort patients by simply being present. With the Jennifer story, “I’M HERE: Compassionate Communication in Patient Care” book and the I’M HERE wristbands, the goal of the I’M HERE MOVEMENT is to give health care pros this constant reminder how important those words and presence are for patients and families. The I’M HERE MOVEMENT is a 501-(C)3 non for profit which is changing the culture of care through the use of two little words. It is a global effort to help health care professionals embrace the power they have to comfort patients by simply being present. With the Jennifer story, “I’M HERE: Compassionate Communication in Patient Care” book and the I’M HERE wristbands, the goal of the I’M HERE MOVEMENT is to give health care pros this constant reminder of how important those words and presence are for patients and families. A commitment to provide presence in patient care. A moment 20 years in the making! Jennifer comforted Marcus with the words “I’m here” immediately following his trauma. Watch Jennifer and Marcus reunite two decades after that horrible evening and learn what a profound impact they each had on one another. Listen in as she learns her patient not only survived, but brought along a message for her – and the world. Modern medical technology helps patients recover faster than any other time in history. However, the human interaction between patient and care giver is still the essential foundation of healing. “I’m Here” is a personal narrative from the patient’s perspective. 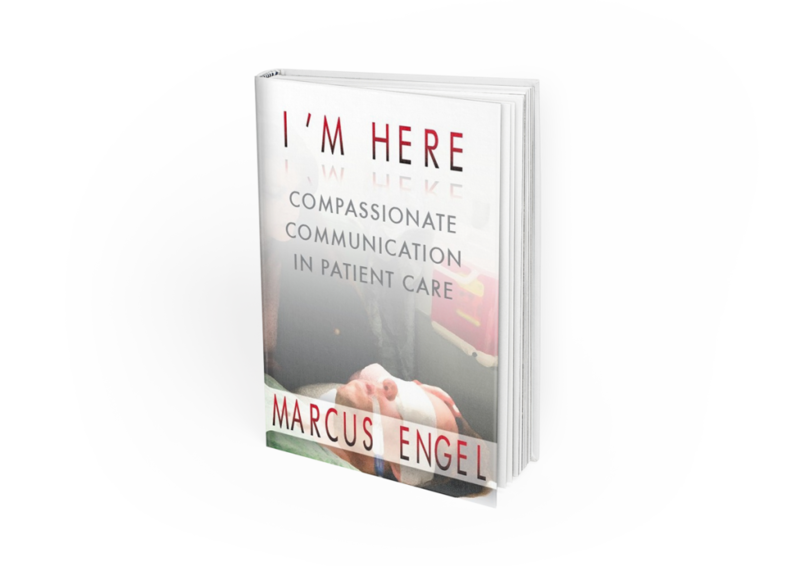 Filled with practical advice, packed with humor and overflowing with appreciation, Marcus Engel encourages health care professionals to practice compassionate communication in all its forms. Contact us to learn more on ways your organization can partner with Marcus!